This exhibition is split into chapters, which can either be navigated page by page or through your area of interest with a full list of links at the bottom of each page. Clicking on images will take you to their dedicated object page, where you can learn about the individual piece in detail. Vivienne Westwood is perhaps the first high profile designer to reintroduce the corset to the catwalk in her 1987 Harris Tweed collection, yet it was Jean-Paul Gaultier’s iconic design for Madonna’s 1990 Blonde Ambition tour that popularised the idea of the corset as outerwear. However, both of these looks were merely inspired by corsetry of the past and offered no more body shaping than your average bra. In the late 1990s, some designers took this a step further, reviving techniques used in Victorian corsetry – with the help of corsetier Mr Pearl – to create dramatic silhouettes for their runway shows. Thierry Mugler, John Galliano for Christian Lacroix, and Alexander McQueen all showcased breathtaking elaborate garments which paved the way for the twenty-first century’s corset revival. 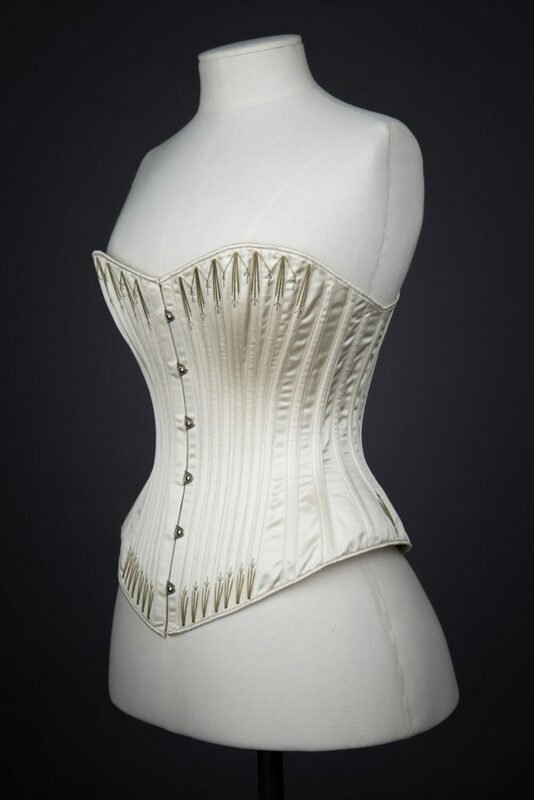 To many, the concept of a “modern corset” is an oxymoron. Corsets are considered by the world at large to be outmoded and anachronistic, but for contemporary makers and wearers alike, we are in the midst of a modern corset renaissance. Modern corsetieres are reconceptualizing corsets both functionally and aesthetically. 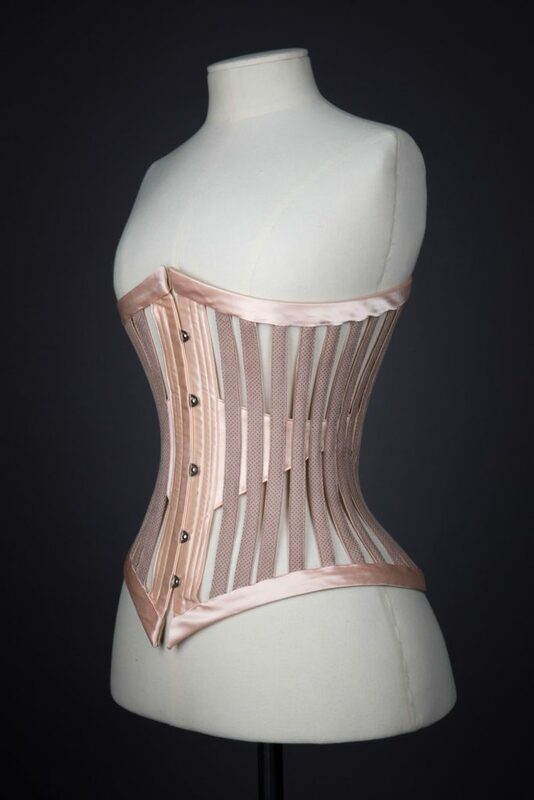 At the beginning of the 21st century, corsetieres focused heavily on “The Rules” of the craft. A “proper” corset had to have a certain number of layers of coutil, for example, or one had to have made at least so many corsets before one should consider going into business. The rules were often based on what makers thought they knew of antiques at the time… but the understanding was incomplete. 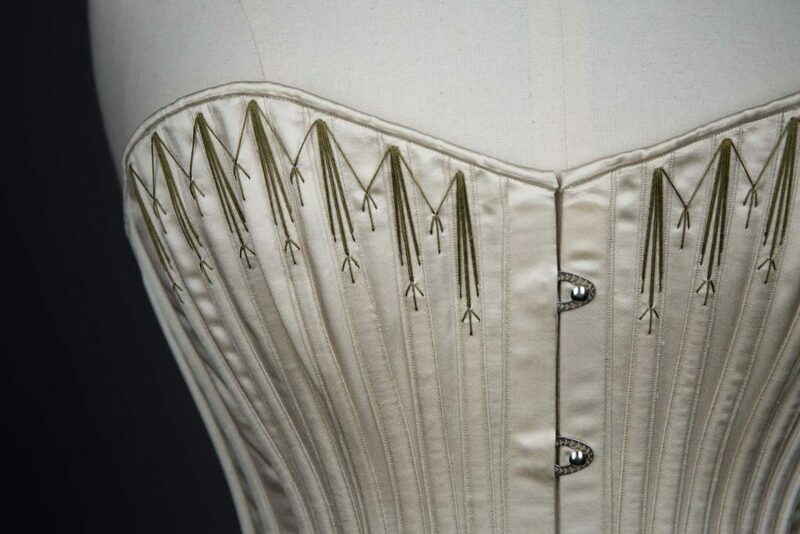 The corset-making revolution had many key players, but Foundations Revealed stands out as the vanguard. Foundations Revealed offered a monthly subscription of in-depth how-to articles for creating period undergarments, written by professionals. Before Cathy Hay launched this resource, information on corsetry was either closely guarded, or scattered and confusing. With Foundations Revealed, corset makers came together. New figures rose to prominence, sharing their knowledge on techniques both new, and tried and true. From this tight sense of community arose the Oxford Conference of Corsetry, furthering the energy and knowledge sharing as begun by Foundations Revealed. 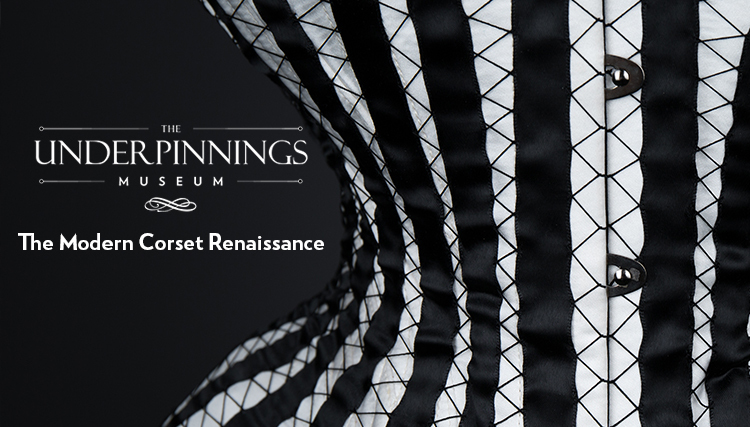 The presence of The Underpinnings Museum at the 2017 Oxford Conference of Corsetry was another step on this path, revealing overlooked sources of historic inspiration to an eager audience. Fabric: Cotton/silk satin with cotton lining. Silk flossing. Vanyanis engraved busk. 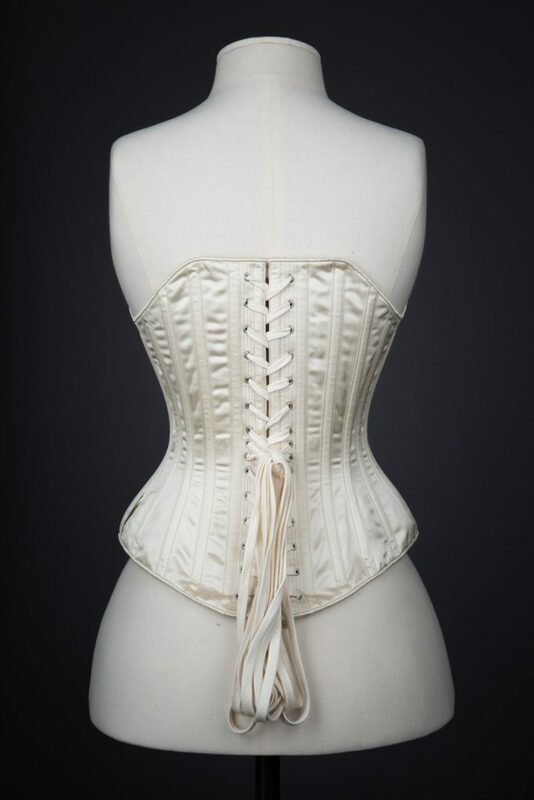 This corset is made to measure from an 1890s pattern found in the Symington company pattern books. Original boning placement and flossing designs have been reproduced. Its base is a silk/cotton satin blend, with cotton lining and boned with synthetic whalebone. 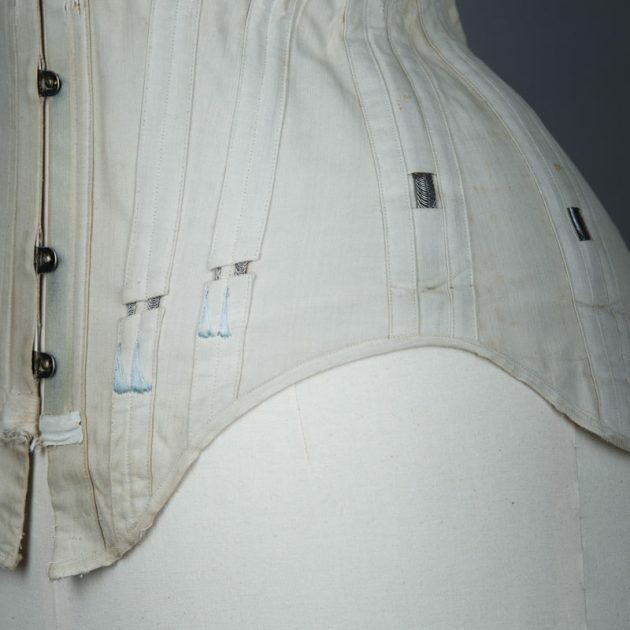 The corset has been constructed with an incredibly narrow stitch length and binding, both features that are rare in modern clothing but much more common in antique corsetry. Cathy Hay’s belief is that the most innovative progress in the present day can only come from a solid grounding in the rich research and development undertaken during the 19th century. 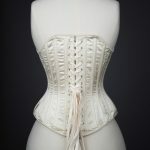 Modern corsetry is intrinsically connected to its Victorian roots, and from there, back through the whole history of fashion. She considers the corset to be so much more interesting as an evolving creature with a life of its own than it is as an isolated branch of modern dressmaking. Modern corsetry is youth, exuberance, enthusiasm and experimentation – but it is also the latest chapter in a much larger story. 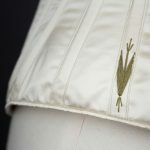 I have a fascination with the history of corsetry in the same way that I am intrigued by the history of any place I visit – not just “Ooh, pretty!” but “Why is that here? Why is it arranged the way it is? 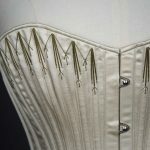 What was the purpose of each of these elements when it was originally built?” With that depth of knowledge comes understanding – and I believe that modern corsetry will go to truly interesting places when it acknowledges and really makes time for that essential grounding, instead of guessing its way through modern sewing techniques to a reasonable imitation. 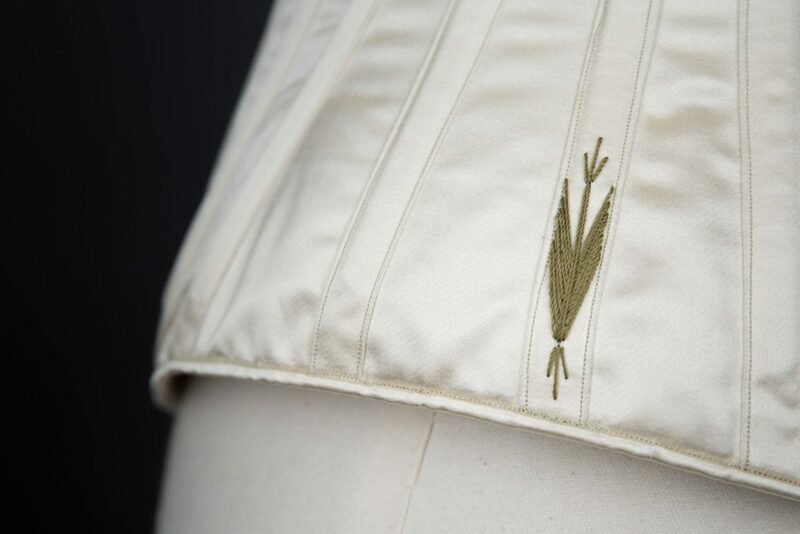 One of the greatest learning tools in a modern corset maker’s arsenal is the study of extant garments. Creation cannot exist in a vacuum; past design will always influence future creations. 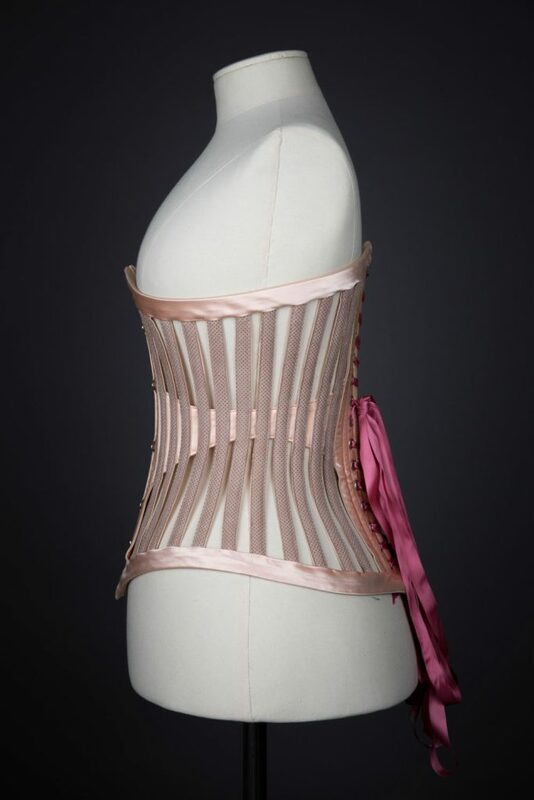 Modern corset makers have their own challenges to overcome, with different resources, materials and tools available, forcing them to engineer and adapt. It’s easy to draw parallels between the modern renaissance and historical corsetry. Certain features remain unchanged, with makers still relying on busk fastenings, flossing embroidery, eyelets and lacing. We no longer have specialist flossing embroidery sewing machines, so this embellishment form has become its own painstaking hand craft. Endangered baleen bones were long ago replaced with steel… but technological advancements brought us plastic synthetic whalebone, which behaves comparably. 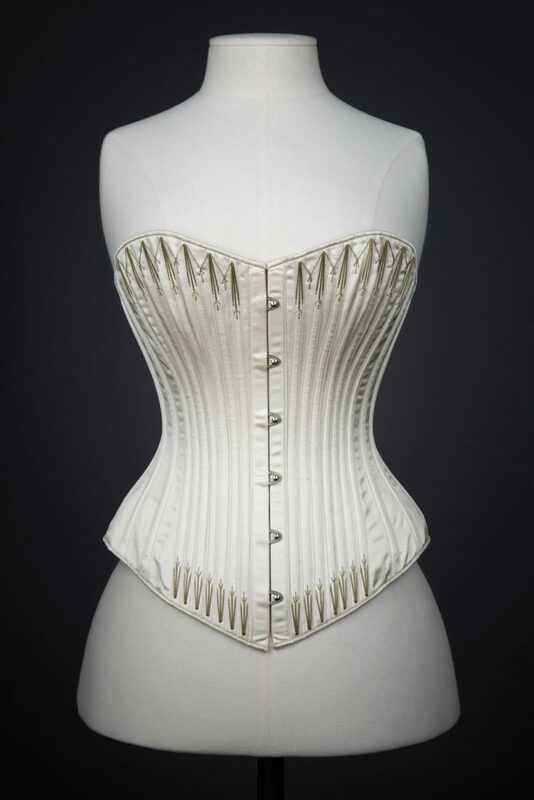 'Stella' Ivory Satin Corset With Flossing Embroidery & Cording by C. T.
Black Cotton Sateen Corset With White Flossing & Woven Trim by P. N.
Fabric: Silk Satin, coutil, satin ribbon, silk floss, antique alenciennes lace, leavers lace. Linen/cotton blend lining. Cotton twill waist tape. A combination of flat steel and spiral steel. Calliope was commissioned as a bridal corset and also a contestant in the 2016 Foundations Revealed Corsetry Contest. 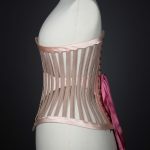 Calliope is a modified reproduction of an antique corset in the corset pattern collection of Joëlle Verne of Atelier Sylphe. Atelier Sylphe corset patterns are meticulously drafted from Joelle’s personal antique corsets. 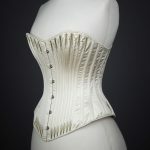 This corset was made using singly layer construction with applied internal bone casings and a floating lining. All binding and embellishments were carefully stitched by hand. 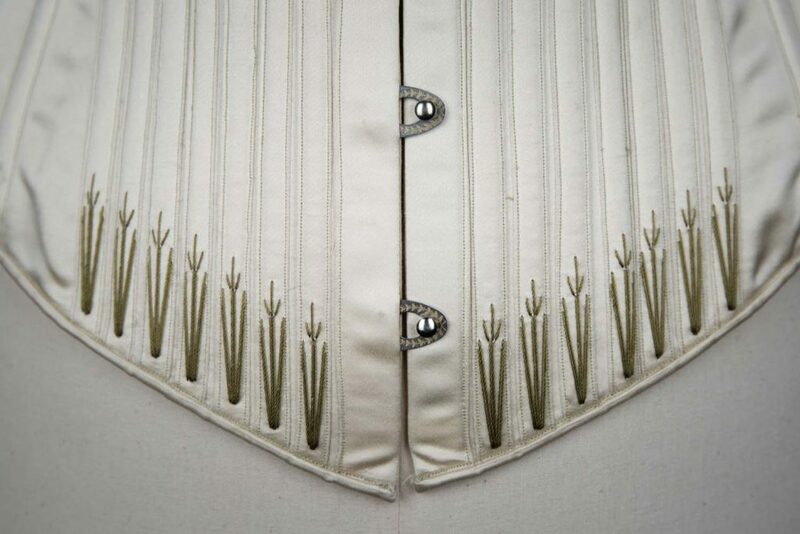 The construction of this corset is recorded in this dress diary. Modern corsetry to me is all about freedom of expression. 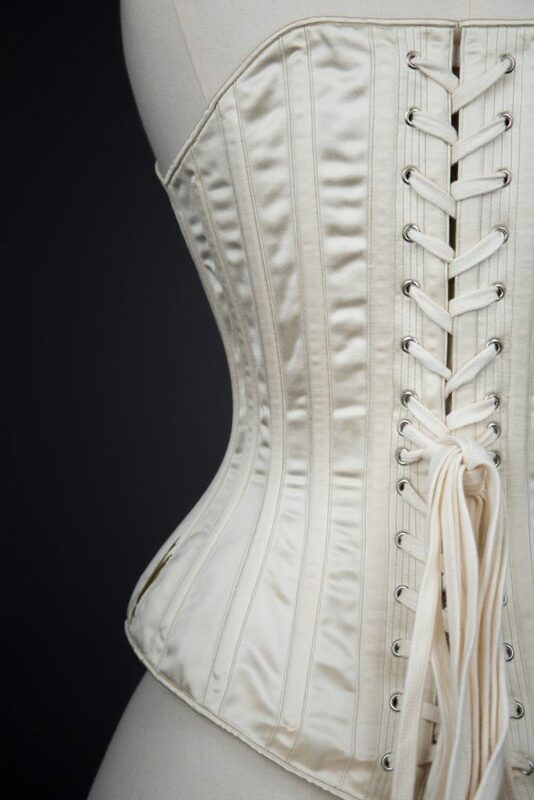 A corset is not merely required clothing, as it once was. Today, corsets are worn by choice and hence, they are no longer just clothing… corsets are fashion. They are, all at once, controversial, historical, and seductive… Alluring, defining, and suggestive. They are underwear and outerwear, both functional and extravagant. And they are some of the most desired and defining pieces of the wearer’s wardrobe… often the owner’s favorite garment. 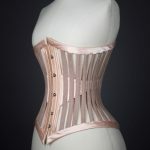 The inspiration for this design came from the Victorian ventilated corsets (one of which the designers was able to see in person when the Symington collection was exhibited at the Oxford Conference of Corsetry in 2013). The corset belies a complexity. It appears that the vertical bones simply need to be attached to the three bands. However, it is tricky to angle the boning channels against the sloping top and bottom bands so that they fall plumb and are evenly spaced and symmetrical. 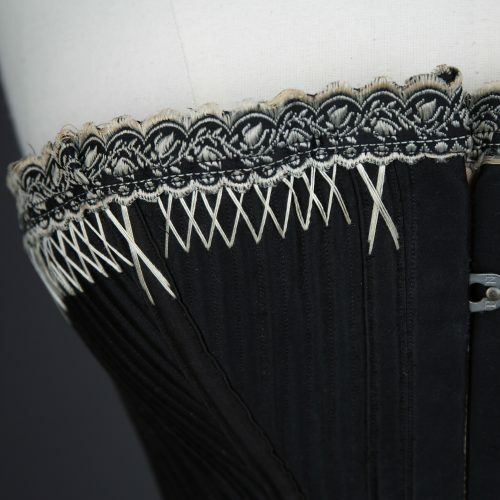 The corset was patterned using Computer Assisted Design software, as it would have been difficult to achieve this level of precision using traditional paper and pen drafting techniques. The vertical boning channels are strips of coutil binding faced with leather cut to the same size. The waistband is double layered satin coutil and the top and bottom bands are satin coutil faced with cotton coutil. 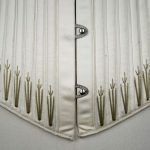 The vertical channels slot into the bands between the two coutil layers and are constructed so there is no visible external stitching. [Modern corsetry is] not about the design particularly (I think there are many historical corsets that look modern and fresh) – for me it is about how we take elements from what has gone before and add them to the mix using interesting modern textiles and technology to aid and speed up the process. In the historical camp we have corsets made using natural fibres and materials using age old drafting techniques. 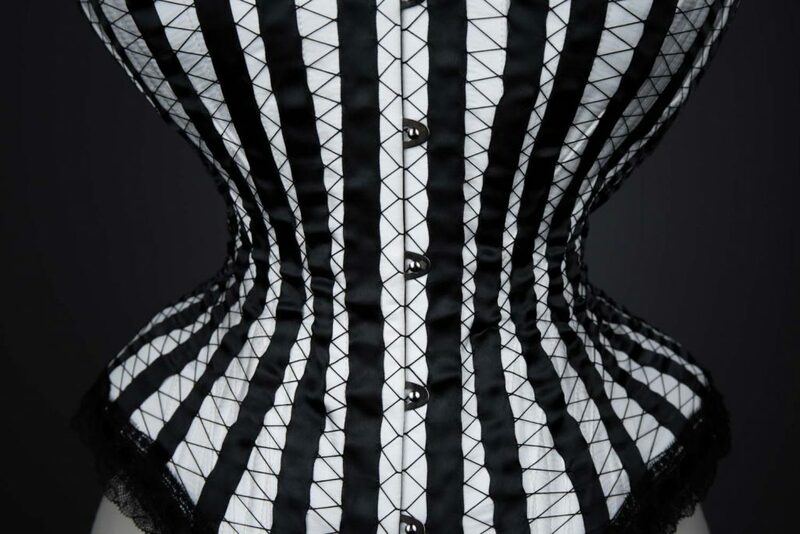 Now we have incredible possibilities – every conceivable type of fabric, 3D printing and body scanning to name a few – this is what makes modern corsetry so exciting. 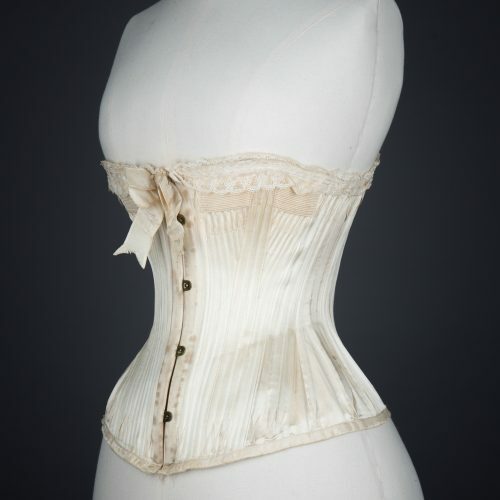 Although corsets were always intended as a kind of underwear, they were never worn against bare skin. Whilst modern design plays with revealing and concealing the body beneath, historical design often played with revealing and concealing in other ways. This example features cut away bone channels to reveal the internal structures of the spiral steel bones beneath, a relatively new and still exciting technology at the time. The Underpinnings Museum relies on your generous support to continue its work. 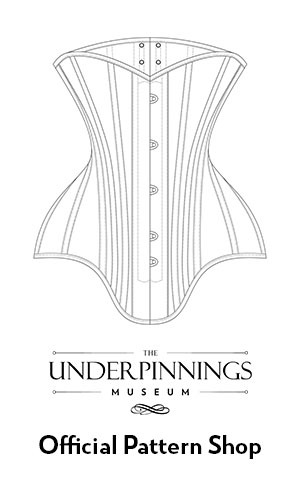 If you’ve enjoyed visiting the website, please consider donating to The Underpinnings Museum or purchasing some merchandise. All funds are invested directly back into the project to bring you more free access underwear history.